The year 2015 has come to a close and before we get too far into 2016, I thought it might be interesting to review the year from a hydrologic perspective given all the recent attention to El Niño and the December 27-30 high water event on the Great Miami River and its tributaries. The Great Miami River Watershed received an average of 45.26 inches of precipitation in 2015. The 30- year average annual precipitation is 41.18 inches, so 2015 was well above average. Precipitation was significantly above average during the months of April, June, July, and December. February, May, and September were significantly drier than normal. No record highs or lows were set in 2015. Above-average precipitation in 2015 led to above average runoff. Runoff is the amount of water carried out of a drainage area by streams. Runoff for the Great Miami River was measured at 18.37 inches for the year, which is 5.34 inches above average. At least one Miami Conservancy District dam stored water on 12 different occasions in 2015. The average number of annual storage events for the MCD flood protection system is eight. The largest storage event was the December 27–30 event when all five of MCD’s dams were storing floodwaters. Together the dams stored 14.2 billion gallons of water behind the dams. This event ranked as the 32nd largest storage event in MCD history. All in all, 2015 was a continuation of a rising trend in precipitation for our region. 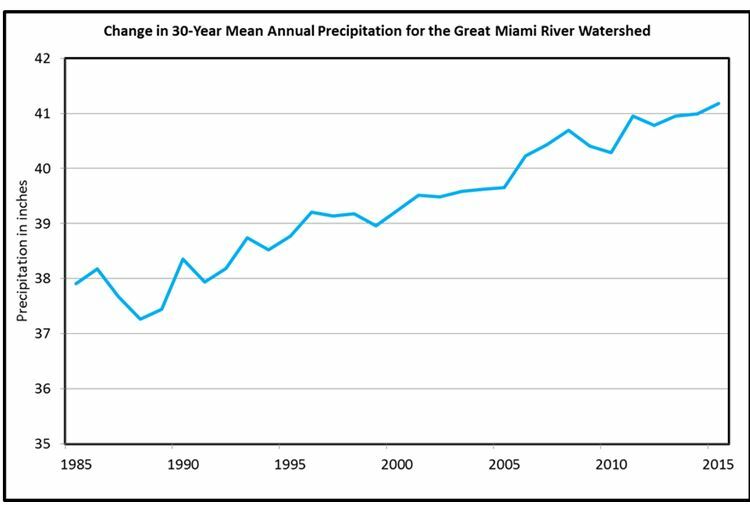 The chart below shows how the 30-year average annual precipitation for the Great Miami River has changed since 1985, and has been rising sharply since the 1990s. What can we expect if this trend continues? The answer is more rain, more runoff, and more high-water events. More than 4 feet of precipitation in 2018!